Welcome back! I hope you all had a wonderful two weeks and are excited to get your children back to school. Our staff members had a productive professional development day on Monday and were looking forward to seeing our students today. We had an amazing turnout at our Watch DOGS Pizza Night on December 15 and our first Watch DOG is with us today. We will have one with us each day this week. 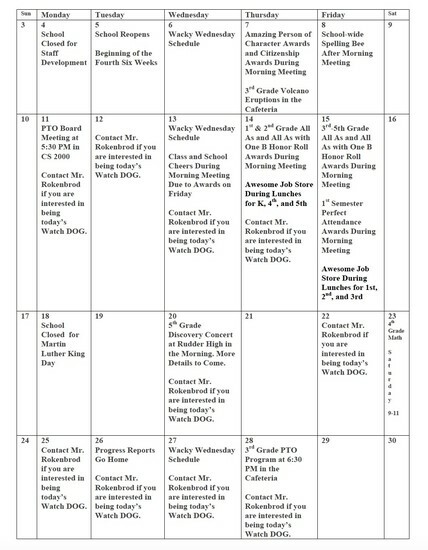 The calendar below (or on the next page depending on the format you are viewing this in) shows what days over the next month that we do not have a Watch DOG scheduled. Fathers, step-fathers, grandfathers, uncles, and other male role models may contact me at (979)209-1405 or via email at john.rokenbrod@bryanisd.org if they are interested in volunteering either on one of the available days or another day later this year. All volunteers must complete the BISD volunteer form and be cleared before they can work with students. The online volunteer form can be found at http://tinyurl.com/prklgum. 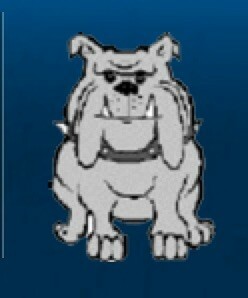 Information about the national Watch DOGS program can be found at http://www.fathers.com/watchdogs/allaboutwatchdogs/. We will hold our next Awesome Job store on January 14 and 15 during lunches depending on your child's grade level. The third six weeks honor roll awards and first semester attendance awards will also be held on the 14th and 15th. These days will allow the awards presentations to fit better with our daily schedule. More information about all of these events is in the calendar. We now have a Giving Tree on one of the walls in the Kinder Corner. Please stop by, pull off a leaf, and fill a classroom’s need.